← Can a Data Center Operate With No UPS or Generator? Maintenance is the key to extending just about anything in life and data center UPS batteries are no exception. When data center UPS batteries are neglected, what could be small and easily fixed problems, or completely preventable issues, grow and grow without notice until, one day, they become a problem. Routine monitoring, coupled with appropriate maintenance are a combination that will not only help maximize uptime in your facility but can help prevent major disasters from happening. How reliable your data center is depends on your UPS system, and how reliable that UPS system is depends on the quality of batteries and how well they have been maintained. Without proper upkeep, a troublesome domino effect begins that will eventually become a major problem that would have likely been prevented with routine monitoring and upkeep. Downtime is both frustrating and costly, with just seconds of downtime posing a major concern. Data Center Knowledge points out why UPS battery maintenance should be made a priority, “Data center surveys have shown that anywhere between 65 percent to as high as 85 percent of unplanned downtime can be attributed to battery failure of some kind. This means your facility is almost certainly at the mercy of a room full of what basically remains 1800’s technology. It only takes a single unit failure within a string of lead acid batteries to make that entire string useless so it follows that even several strings of batteries need only have a few bad units scattered throughout it to render the entire emergency power system useless.” The tricky part of data center battery upkeep is that there is no one-size-fits-all approach that will be successful. Rather, each data center must assess the infrastructure in their specific data center, as well as demands and goals and develop a proper monitoring plan. This can include automated monitoring with alarms but should not rely solely on it. An effective plan will also include routine, visual battery inspections in person to ensure that you have the best knowledge with which to make decisions. When figuring out what should be concerning and incite action with a battery, the individual battery and specific manufacturer instructions must be factored in. 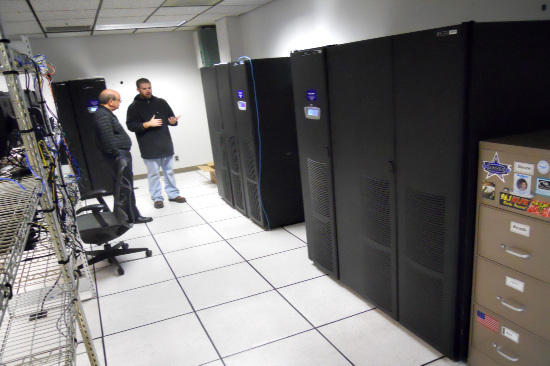 Data Center Knowledge elaborates on this concept, “It would be much simpler if every battery had a one simple set of parameters however the reality is that these parameters vary from battery manufacturer and battery model. There are many considerations, from simple float voltage to the temperature compensated settings of the rectifier being used. The alarms can signal issues with string voltage, unit voltage, impedance, ambient temperature, unit temperature, ripple and record discharge. These alarm limits have different priorities, ranging from lower priority maintenance pointers to more immediate critical issues. So which are the important ones? All of them. If unsure, talk to the battery manufacturer about what limits to set alarms to.” Through the implementation of an effective monitoring system, as well as proper routine maintenance, the life of a UPS battery in a data center can be dramatically extended, saving money and protecting a data center from downtime. This entry was posted in Data Center Battery. Bookmark the permalink.